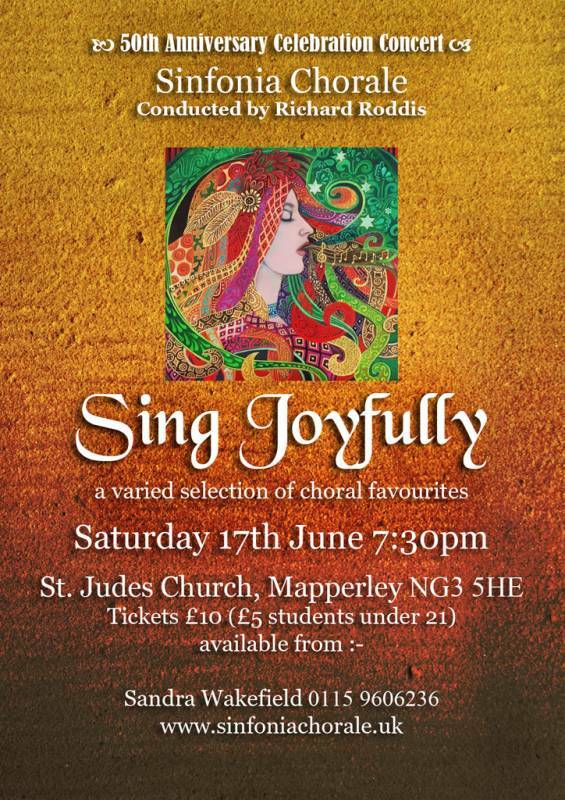 In complete contrast to the large scale celebration of the spring concert at Southwell Minster of Bach’s B Minor Mass plus Baroque orchestra, the summer offerings were much more intimate, even minimal in nature. 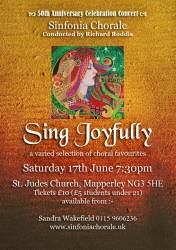 This was due as much to the venues, St Jude’s Church and Oxton Village Hall, as well as the selection of a cappella pieces performed. The choral items chosen were all old favourites, voted in by the choir members themselves and verified by Richard Roddis who had ultimate editorial control. The mixed and atypical programme included sacred and secular compositions, madrigals, spirituals, a soundscape, folk, Mass sections, a 20th century setting and a Spanish song. 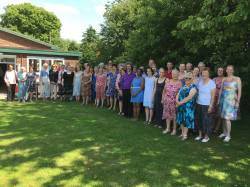 Furthermore, the 50th anniversary celebration season continued with an open invitation to past members to sing a number of items with the present day choir. The longer serving members of the Chorale, remembering previous singing comrades, welcomed the visitors to participate in this unique event. The past members joined us for the eight part Lotti Crucifixus, the Tallis anthem If ye love me and Pearsal, Lay a garland. In the second half, past members helped to generate a fuller sound in the Gloria, Sanctus and Agnus Dei sections of Vaughan Williams’ Mass in G minor. Despite the exceptional heat (temperatures of 30 degrees centigrade were documented!) 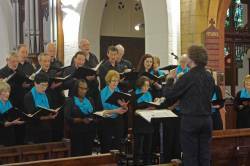 the Sinfonia Chorale endeavoured to ‘Sing Joyfully’ for a modest audience of about 50 at St Jude’s Church. There were several poignant moments, such as the emotional amen in the Parsons Ave Maria, the dynamic contrasts within Bruckner’s Locus Iste, the Lotti Crucifixus, the spiritual, Good News, Whitacre’s Sleep. Seasoned singers know that the warmer the environment, the greater the tendency to flatten in pitch and despite many effective moments, the Britten was a casualty of the extraordinary heat, unfortunately! There were chuckles from the audience during the light hearted spiritual, Oh you’ll never get to heaven, which was arranged by a late member of the Chorale, Michael Ockenden. The second half, which was more secular in nature, opened with the lively Weelkes madrigal, Hark all ye lovely saints. This was juxtaposed with the melancholy Silver Swan (Gibbons). 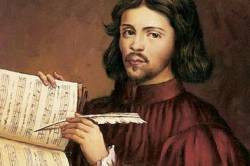 The Spanish inclusion by Josef Vila was given to the choir when on tour in Catalonia, it was written for the host choir there and given to Sinfonia Chorale as a friendship gift. The translated title reads ‘A song In your ear,’ which again reflects the more personal nature of the last two concerts of the 2017 50th Anniversary season. Whitacre’s Sleep bloomed into a richly layered soundscape after a heat induced shaky start! Providing acoustic variety, the Roddis American folk song arrangements were the only two pieces with piano accompaniment (played by Liz Pike). The past members once again joined the existing Chorale for the ultimate concert item, the Gloria, Sanctus, and Agnus Dei sections of Vaughan Williams’ Mass in G Minor. With its solo lines and a solo quartet, all drawn from current choir members, the Mass produced a reflective conclusion to the concert. A slightly curtailed and less formal programme was presented for the Oxton Village Hall concert on Sunday 18th June. One notable difference was the delivery of the Tallis anthem; this time it was performed in the round with vocal parts completely mixed and the choir (plus past members) encircling the modest audience of about 40 people, producing a 'surround sound’ experience for those listening. During a brief interval, a collection was held for the Malawian charity Water Works which raised over £358! The Oxton concert was followed by a sumptuous high tea, with Steve Thorpe’s vegetable samoses disappearing rapidly! Glasses of bubbly were raised toast to the Chorale’s longevity and a large cake with the Sinfonia Chorale logo on it was cut and distributed among the choir, past members, guests and audience. People spilled out on to the lawn at the rear of the hall seeking cooler temperatures. Amanda Lees’ children need a mention, as they were very helpful when it came to hosting the tea celebration! 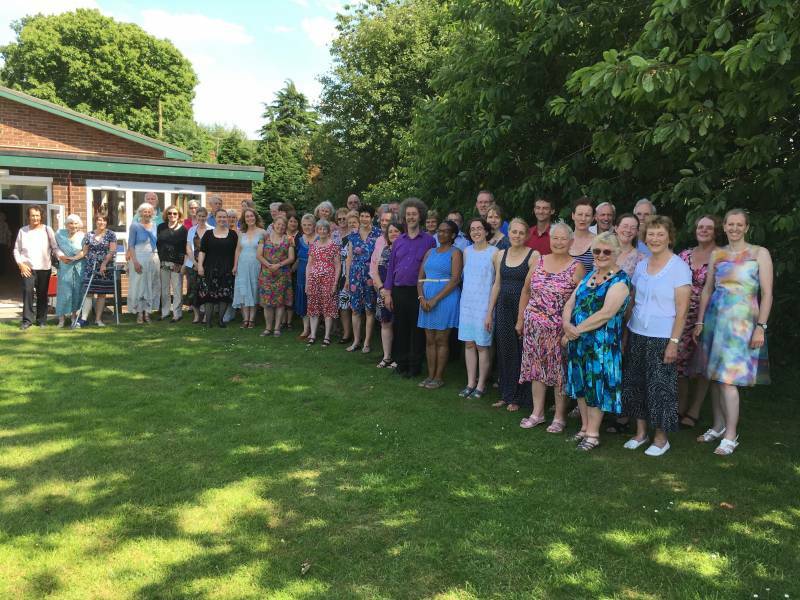 Despite missing a vital tenor due to car trouble, the ambience of the event corresponded with the unusual weather; it was cheerful, sunny and joyful!